It’s a common challenge for building owners across the country: How do we use signage to help our visitors make their way safely throughout the property? Most business owners don’t consider the full value that quality wayfinding signs can bring to their property. But, when you take a look at the subject, there are numerous benefits of investing in high-quality signage. 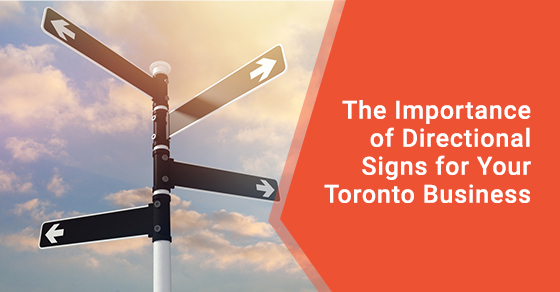 In this post, we’ll explore the value that new directional signs can bring to your Toronto property. One of the first and most obvious benefits of using professionally-designed directional signs is that you can help your customers get to their target destination. Your customers will appreciate having the information available to them and will be able to save time in making their way around the property. Make sure that signs are easy to read and at the right height for the average visitor, to further optimize their convenience. In areas such as shopping malls and large stores, you may find that pedestrian traffic assembles in key areas. Using directional signage can help to minimize confusion for those visiting the building and can prevent large groups of people gathering in walkways and doorways as they try to determine where their destination is located. Professionally designed signs help streamline the flow of traffic throughout p[roperties and ensure that every person can access their target areas with ease. Another key benefit derived from integrating the right signage is building safety. Your visitors will need to know where to go in the event of an emergency. Emergency routes must be marked effectively throughout the property so that occupants can make their way to the exits in the event of a fire or a natural disaster. Using directional signs will ensure that large groups of people are able to make their way safely to these exits without causing unnecessary fear and confusion when disaster strikes. In the retail space, the flow of traffic from one department to the next is linked closely with profits. Supporting the effective flow of customers from one department over to the other can help them to make more effective purchasing choices. In a grocery store, for example, a directional store can be hung over the aisle to indicate the location of a particular product. This makes the shopping process more efficient for the average shopper, and allows the store to support a convenient buying experience. One area that many business owners across Toronto fail to consider is the location for their exterior directional signs. The signs should be placed in a location with high levels of foot traffic and should be designed in a way that appeals to a large audience of potential visitors and customers. Consider where the majority of your customers are coming from when they arrive at your business. Is the company placed in a large strip mall or at the end of a path? Use the direction of pedestrian traffic in the area to guide you when creating and placing exterior directional signs. The size of the sign should be taken into careful consideration when you’re producing wayfinding signs for your business. If you place a large sign at a quiet location with heavy pedestrian traffic, the sign could detract from your reputation as a company and may put people off from visiting your business. However, if you place a small sign at a busy intersection with significant amounts of vehicle traffic, your sign could be lost to the noise and movement around it. Take the time to review the local environment and choose a style of sign that both suits the space and stands out for its appeal. One area that many business owners fail to consider when choosing directional signs is their flooring. You can make great use of the empty space on tile floors by adding decals and other forms of signage that provide directional guidance within the building. Take the time to review areas in your property where floor signs can be used effectively. For example, when you have a wide flooring space that leads to several pathways in the building, you can use flooring signs to indicate the pathways and to conserve physical space for visitors. One way in which to endear yourself to your business visitors is to provide information along with the directional details within your signs. For example, if your sign is highlighting the direction to your company cafeteria, you might show the hours the cafeteria is open for the general public on the directional sign. This will help to minimize the annoyance of making their way to the destination only to find it’s closed or otherwise inaccessible. When your brand requires high-quality sign products for its buildings, our team at New Style Signs can provide the ideal product for your precise signage requirements. We have years of experience in the industry and have created signs for a broad range of clients across the marketplaces. We’re also committed to creating the best-looking and most durable signs in the industry today. We have over 50 years of experience as professionals in the sign manufacturing industry in the GTA. T To learn more about our company and the complete range of signs we offer within our wide-ranging catalogue, contact us today. Part of establishing your brand as a go-to staple for a given market comes down to raising awareness of what you have to offer. Potential clients can drive past a business’ flashy, eye-catching sign every day and remain unaware of how that business may be relevant to their needs. That’s not to say that a simple, fuss-free sign displaying your business’ name doesn’t have its place. However, if you feel that your business name doesn’t speak for itself, you may want to consider incorporating more information into your sign’s design or having more than one sign (provided a cluttered look is avoided). For instance, you can use signs to advertise specific products or services that are staple, stable components of your brand. A custom design can increase the memorability of your sign’s lettering or layout when designed to include on-brand imagery with aesthetically pleasing elements, such as complementary colours or textures. It’s important to not take a “one-size-fits-all” approach to your choice of sign style. While one business’ use of signage may have stood out to you as being particularly memorable or successful in building that brand’s awareness, every business’ needs are unique. Some considerations that can impact your choice of signage include your business location’s visibility, message versatility, and the benefits of unique customization. 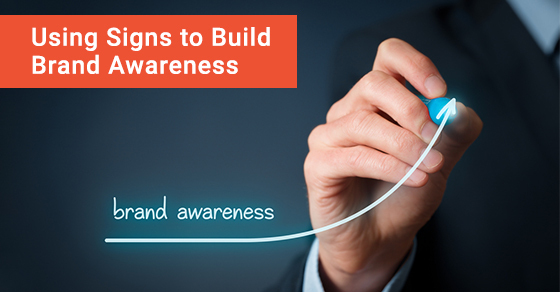 Let’s take a look at a few options that can address your business’ brand-building needs. When considering signage, it’s important to factor in the location of your business and how this impacts a potential client’s first and ongoing impressions of your brand. Pylon signs show their fullest potential from far distances. While perhaps not the best to put on a small, quiet street corner, these signs can act as a much-needed landmark and instill confidence in your brand—clients will appreciate the ease of access and not having to hunt down your address. Illuminated channel letter signs, like pylon signs, are another good option for areas with lower visibility. These signs broadcast a brand around the clock and shine bright in under the worst of weather conditions. In addition to acting as a memorable landmark, illuminated signs lend your business the impression of an established, professional appearance. Directional and wayfinding signs are an even more practical way to ensure your business is literally not “lost” in a busy crowd. The presence of these signs alone can promote the sense that your brand is reliable—after all, nothing is more frustrating than attempting to access a business’ services and finding yourself having to wander outside a poorly marked building or plaza aimlessly. It’s far easier to instill trust in your brand when a client’s first point of contact is hassle-free. Signs used to direct clients can also help to lessen foot traffic cluttering up certain areas and gives the impression that your business is established and organized. Moreover, interior office and braille signs will give clients further confidence in your business as soon as they set foot in the door. Simple and accessibility-friendly signs that mark the location of bathrooms, hallways, and stairs only serve to bolster your brand. While some businesses have a single, tried and true brand message to get across, others rely on signage that can regularly update messages for current and potential clients. Some older sign styles—such as those with rearrangeable and removable letters—can appear too outdated for some businesses. That being said, readograph signs are a viable option if your business requires message versatility and if this simple, traditional style aligns with the rest of your branding. LED signs are better suited for reading at closer distances than some other sign options, as they display digitized messages. However, their bright quality will still work to make your brand message pop. If your business goal is to draw client interest with temporary promotions, sales, messages, or updates, LED signs can be quickly and easily updated while also boosting interest in your brand, especially among regular, passing commuters. Sometimes, less is more with an aesthetically pleasing, well-placed design that highlights your unique brand. Custom metal letter signs are designed to make your brand stand out, big and loud, while maintaining a professional appearance due to their durability under Canada’s harsh weather conditions. You can have your logo carved in a variety of metal materials, depending on the style that is consistent with your brand. A unique logo in a three-dimensional style is both visible and memorable for potential clients. Metal or acrylic plaques made using cutting-edge engraving and etching technologies are beautiful additions when customized for branded signs. They lend a polished appearance and can further show your business’ value of excellence when used for commemorative or award displays that appreciate past or present donors or outstanding employees. If needed, you can customize your signage to align with styles specifically designed for schools boards’ and churches’ unique needs. Even construction project signs can turn an in-progress real estate construction site into a talking point of interest for potential clients (such as tenants or investors) when presented in an eye-catching and informative way. If you’re looking to further build your brand and attract clients, or simply want to learn more about the best options available for your business, look no further than New Style Signs. With over 50 years of experience supplying high-quality signs across Toronto, Mississauga, and Brampton, our sign specialists will work with you to refine and realize your vision in building brand awareness. To get started, call New Style Signs at 905-363-0101 or contact us here to request an estimate.